Vincent Zhou is a figure skating phenom. He has distinguished himself at a very young age. 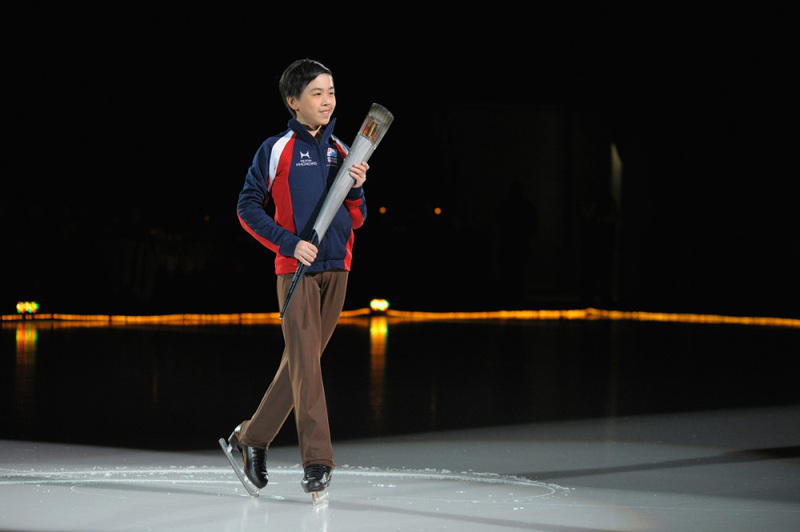 In the 2010-2011 season, he became the youngest Intermediate Men’s Champion to win the US Junior Figure Skating Championships, and at age ten, he perfectly executed all non-Axel triple jumps in competitions. In the 2011 -2012 season, Vincent became the Novice Men’s national champion at the 2012 U.S. Figure Skating Championships, setting record for the highest score under IJS. 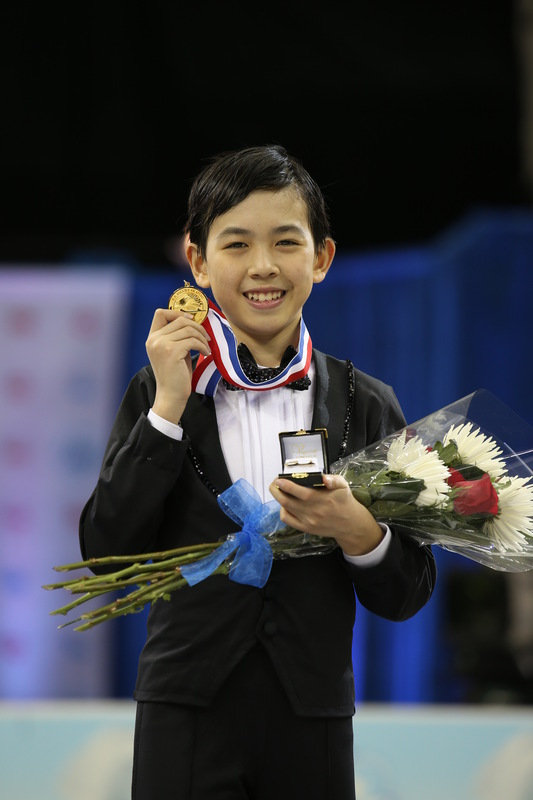 In the 2012-2013 season, Vincent has become the youngest Junior Men national champion in the U.S. history. In the 2013-2014 season, Vincent competed at the Senior level, and was the youngest Senior Men competitor in U.S. history. Vincent didn’t compete in the 2014-2015 season due to injury. 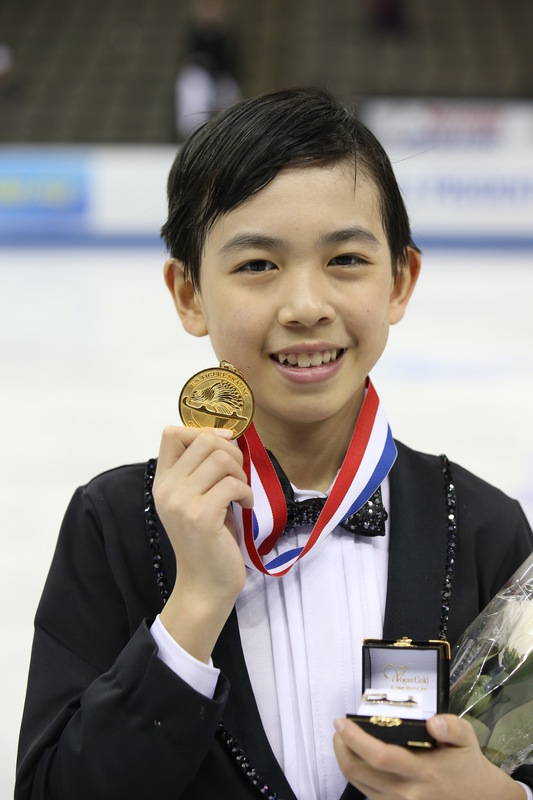 In the 2015-2016 season, Vincent landed his triple Axel and two quadruple jumps clean, and qualified for the ISU Junior Grand Prix Final in his first JGP season. Born in San Jose, California in October 2000, Vincent moved with his family to Palo Alto at the age of 2 1/2. He attended the neighborhood public school, Hoover Elementary, until his vigorous training demands forced him to switch to an online charter school, Capistrano Connections Academy. Before devoting himself exclusively to skating, he excelled in soccer, swimming and piano. Vincent’s interest in skating began at the age of 5 1/2, thanks to a friend’s birthday party at a local skating rink. He soon began with group lessons. At the very first lesson, he was already zooming freely across the ice like a rocket, while the other children were holding onto the boards or struggling hard to maintain their balance. With this inherent talent, Vincent quickly switched to private lessons with Julie Lowndes and Charlie Tickner, a two-time world champion and Olympic bronze medalist. After a year of lessons, Vincent started in competitions, representing the Peninsula Skating Club until the 2011-2012 season. Vincent was also coached by Diana Miro at the Juvenile level. Vincent’s unforseen potential and rapid advancement forced the family to look for a world-class coach beyond the San Francisco Bay Area. After an intensive search, they identified USOC Olympic Developmental Coach, Tammy Gambill, in Riverside, California, who has coached numerous national and international champions. Riverside is a 6 1/2 hour drive from Palo Alto, so in order to enable Vincent to train with Coach Gambill, Vincent’s mother, Fay Ge, traded in her high-tech job for a weekly commute of more than 800 miles. This decision represents a significant sacrifice of resources for the whole family. Every Sunday, Vincent and his mother leave their Palo Alto home to drive to Riverside where he attends training sessions throughout the week before returning to Palo Alto on Fridays. Vincent’s daily routine includes three-hours on ice and one-hour off ice. During the afternoons, he spends four or five hours with his online school. He continues with his online class and homework during the long commutes. Despite his demanding schedule and limited time, he is a straight A student, with an A+ in most subjects. He also won the Presidential Award for Educational Excellence with congratulations from President Obama. 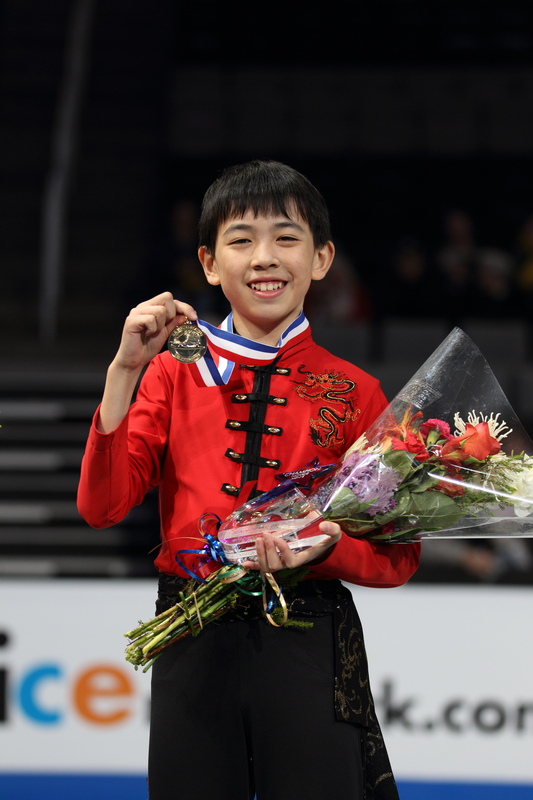 With Vincent’s rapid advancement to the Senior level in the U.S. and Junior level internationally at an extremely young age, the Zhou’s family had to find another coach who would be a better match for the very talented Vincent. Vincent and his mother moved to Colorado Springs in May 2015, and he has since been trained by the Olympic coach and 7-time World coach Tom Zakrajsek. Vincent goes to Cheyenne Mountain High School where Rachael Flatt has graduated from. In spite of his intensive training and frequent travel to competitions, Vincent has been able to maintain an unweighted GPA of 4.0. Vincent has faced many challenges during his pursue of his figure skating dreams, but he has overcome every difficulty with his perseverance and passion for the sport. When Vincent was at the Intermediate level, he couldn’t skate for 2 ½ months due to stress fractures on his right foot. Yet shortly after his recovery, he landed more triple jumps and won the regional competition with the highest score in the nation. Gearing up for the Junior Nationals, he seemed to be in trouble again. Due to a growth spurt, he lost his sense of balance that impacted his jumps resulting in a serious fall. Injuring his left hip, he was forced to stay off the ice for a week—just days before the biggest event of his life. Coach Gambill and her team kept his athletic energy focused and with his irrepressible determination he won Junior Nationals. The commute between northern California and southern California isn’t always smooth. Once as Vincent and his mother drove to Riverside during the winter time, the freeway looked totally different as they approached the mountains at dusk. Silver sheets of snow and ice covered the mountains, and the police had closed the road due to severe blizzards. They were forced to take alternate routes which meant driving all night long through the storm and howling winds. By the time they reached the skating rink, they had been on the road for twenty-two hours! Without wasting any precious time, Vincent got on the ice and skated for two hours, until Coach Gambill ordered him to get some sleep. When Vincent just turned eleven years old and was competing Novice, something unexpected happened to his family. The night before he and his mother left for Salt Lake City from southern California for the 2012 Pacific Coast Sectional Championships, his father remained in northern California and was admitted to ER for a life threatening situation. His father had been staying in the hospital and undergoing a surgery the whole week while Vincent was competing at the sectionals. Vincent remembered what his father told him about the three elements of a successful athlete – attitude, effort and focus, and fought along with his father. He was motivated to do his best and skated a total score of 163.07 points. Vincent had to undergo a knee surgery in September 2013. It was tough for anyone, let alone a young athlete less than 13 years old. He was weary physically, mentally and emotionally. However, he never lost his passion for the sport. Once again, his determination prevailed. When Vincent switched to Coach Tom, the competitive season had already started. Vincent managed to learn the triple Axel and two quadruple jumps in a very short time, and has successfully landed his first triple Axel and quadruple Salchow in major competitions. 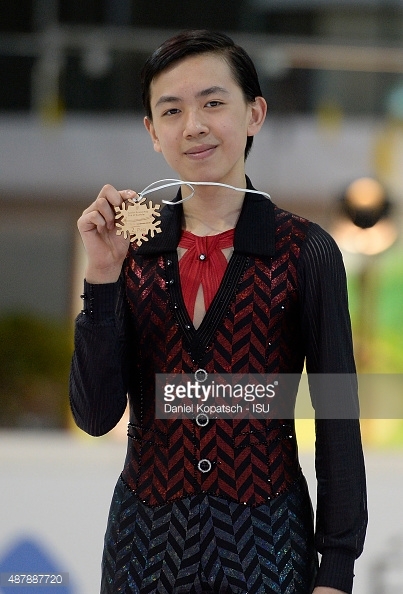 He also qualified for the ISU Junior Grand Prix final in his first JGP season as the youngest among all six finalists, and missed the podium by just three quarters of a point. With unrelenting ambition, Vincent works to continue to improve all aspects of his skating. His ultimate goal is to win the Olympics. He has focused on the 2018 Winter Olympic Games in PyeongChang, South Korea is his opportunity to fully shine. His long-range goal is to compete in the Olympics four times before he turns 30. Vincent has everything it takes to make it to the top — a great work ethic and a great passion for his sport. 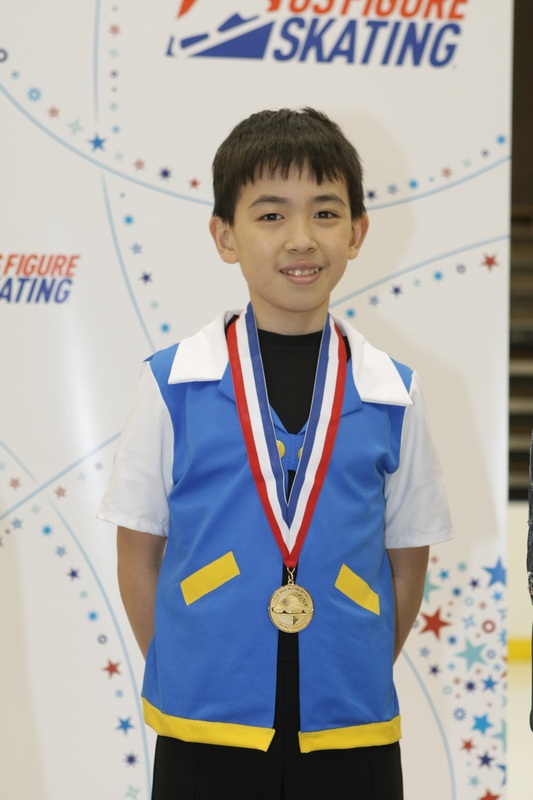 For more information about this amazing young athlete, please visit Vincent Zhou online at http://govincentzhou.com. Competing for the United States at this level requires serious funding from corporations and individual sponsors. Both developing and elite skaters quickly outgrow family-financed training. Vincent continues to show a powerful promise as a representative for our United States. We invite you to Dare to Dream with Vincent and invest in the future of US figure skating. You may send a contribution directly to the New England Amateur Skating Foundation (and indicate Vincent Zhou as the recipient). Contributions to the foundation are tax deductible. To which I would add that Vincent has additional assets, such as intelligence, ability to focus, a sense of fun, etc. Even if he were never to skate again, I see a great future for Vincent where ever fate may take him.